I was introduced to this products a few months back and I have been testing it out since then. The first time I saw VMV Hypoallergenics Id Monolaurin Gel I passed over it because I read that it was primarily for sweat acne and acne treatment, which luckyly I don’t suffer from. Years later, I was replenishing my stocks at the VMV Hypoallergenics store when the advisor asked me if I had tried this gel. I told her I have not because I don’t need it. The advisor knew I was a makeup artist and told me that this product is a perfect makeup base for people with oily skin types because it controls oil and mattifies the face with out drying it. 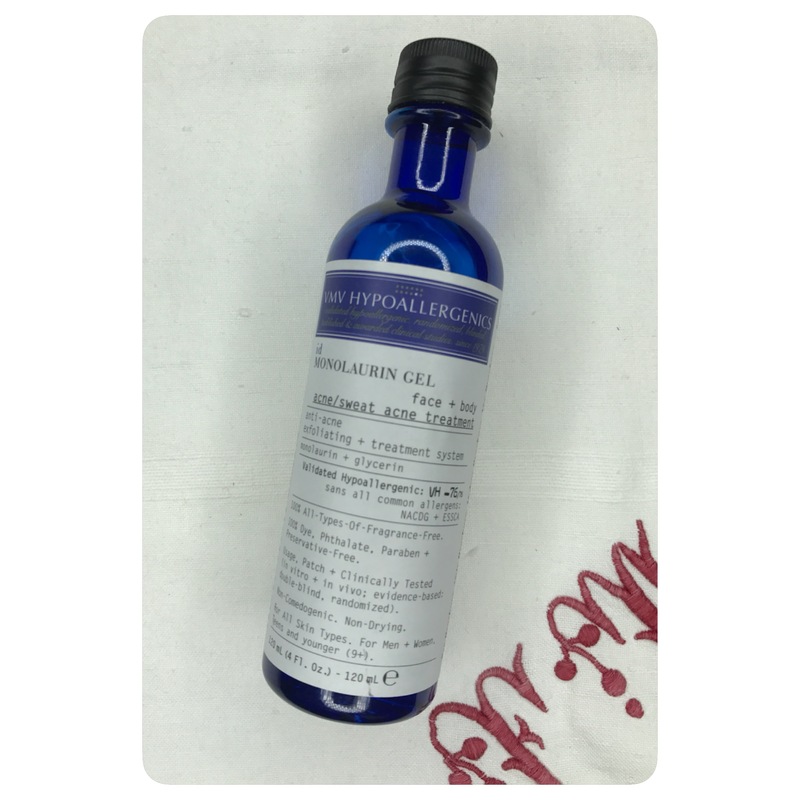 The VMV Hypoallergenics Id Monolaurin Gel comes in a 120 ml blue bottle. You squeeze it, and the gel comes out. The amount of gel that comes out depends on how much pressure you exert unto the bottle. I was initially worried about spillage, but the bottle works like a vacuum, sucking in the gel once you stop squeezing it. Upon first contact, the gel felt cool on my skin. It made me feel relaxed actually. I also felt my skin tighten but it was soft to the touch. That’s when I knew this product was controlling my oil without drying my skin. Unlike some makeup bases in the market, this gel left my skin matte with out the white cast! I proceeded to apply some makeup on and it did not interfere with the slip and slide of the foundation. This is a good makeup base. Since this gel dries quickly, it needs to be applied on the skin as soon as it’s out of the bottle. It’s best to use fingers in doing so. You don’t need to use as much as you think you do. A little bit of the product goes a long way and it’s best to use this on the main problem areas of the skin, i.e. T-zone. If you use too much, flaking can occur. You’ll see white “dust like particles” sitting on top of the skin especially when you “layer” the gel over. You’d need to buff it off with a brush. If you use too much, your foundation might not slip and slide easily. Remember, you’d need a little bit of moisture to make that foundation work. This helps extend the wear of your makeup by inhibiting the oil production process of the skin by a few hours than in comparison when not using VMV Hypoallergenics Id Monolaurin Gel as a base. The main active ingredients of this product are Monolaurin ( Gylceryl Laurate) and Glycerin. Monolaurin is derived from coconut oil, which is known for its antibacterial, antiviral, antimicrobial, and anti-inflammatory effects. That why this is a good treatment for those who suffer from acne, sweat acne, ingrown hairs, waxing and shaving bumps. Glycerin is the ingredient that “locks in” moisture. Recently, my nephew from the US came over for a visit. Having stayed under the sun a tad too much with out sunscreen he came up to me complaining about the discomfort of his sunburn. He asked me if I had anything that could be of help to rid him of the pain of the sunburn. I initially, said I didn’t have any. Fortunately around that time he was asking me, I was arranging my kit and I saw the blue bottle ofVMV Hypoallergenics Id Monolaurin Gel sticking out. I handed him the bottle and I told him to place a generous amount all over his face while I proceeded to apply the gel all over his back. I had a hunch it might work. He said the gel felt cool to the touch and the uncomfortable feeling of being “burnt” was alleviated instantly. He looked less uncomfortable too, which was a good sight. 24 hours later, no adverse side effects. This might be a good aide in relieving the discomfort of sunburn. I was banking on the Monolaurin to work its anti-inflammatory power on him. If you are from the Philippines and you’d want to know more about VMV Hypoallergenics Id Monolaurin Gel , vist the VMV Hypoallergenics Philippines website at www.VMVHYPOALLERGENICS.ph. For the rest of the world visit www.VMVHYPOALLERGENICS.com. In the Philippines this retails for Php 830. In the US and the rest of the world, it reatils for $30. If you are an avid online shopper, VMV Hypoallergenics offers lots of online discounts every now and then. So do watch out . Alcohol, Aqua/Water/Eau, Glyceryl Laurate, Glycerin, Carbomer, Triethanolamine.